The annual community awards ceremony for Hackney Council for Voluntary Service (Hackney CVS) was celebrated in the Halkevi Centre in Dalston this week. The achievement awards were established to commemorate the lives and work of two former employees: Adiaha Antigha, the late Hackney CVS Chief Executive and the late Gary Francis, the Youth Programmes Manager. The awards were presented by their former Hackney CVS colleagues, Jake Ferguson, who is the current Chief Executive, and the Chair, Gail Mistlin, to those who have dedicated their lives to helping others. Over 300 people voted for the 22 nominees – among them a long-respected community stalwart 83 year-old activist Shirley Murgraff, the “imaginative” housing campaign group Digs and a 16 year-old chef who has battled against the odds to find work. The Adiaha Antigha Lifetime Achievement Awards were awarded posthumously to “two community champions”. The first was awarded to Buzz Johnson, a much-valued community activist who passed away earlier this year. Buzz Johnson’s son gave a speech in which he paid tribute to his father whose “dreams surpassed the reality of his means”. Mr Johnson was not only a local community campaigner, said his son, but a “true internationalist” who in the “vibrant period” in the 1980s fought for improved race relations and against inequality. The second Lifetime Achievement award went to Ron Newman, a disability campaigner who passed away following a battle with cancer a few weeks ago. As well as reflecting on those lost, the ceremony was also an opportunity to champion those continuing their legacy. The Gary Francis Achievement Awards were given to eight young people, nominated by local organisations, “who have overcome adversity to make significant and positive changes in their lives”: Shekeila Scarlett, Shem Roberts, Charlotte Burgess, Devante Adams, Ahmed Ali, Jasmin Alvarez, Amron (TJ) Buchanan and Jamari Furrs. It was Mr Francis’ “unwavering support for young people” and his tenacity in challenging and confronting authority that made him an inspiration for Hackney’s youth, said Dave Ramdial from Hold it Down. The Adiaha Antigha awards are made up of four categories. The award for the individual or organisation that has successfully challenged racism was won by Hackney Unites. Hackney CVS’ project Connect Hackney has recently been awarded almost £6 million of National Lottery funding. CEO Jake Ferguson said the money would go towards “helping older people help themselves”. The second award recognised the organisation or individual that has made a difference for older people. The award was won jointly by Mary Mesteller of Skyway charity, and Cynthia White of City of Hackney Older People’s Reference Group (OPRG) a key partner in the bid for the lottery funding who demonstrated that “older people are community asset and not a problem to be solved”. In a competitive category comprising nine nominees, the award for those who have worked best in partnerships went to Shade Ajigbeda & Vibert Murdock of High Hill Residents and Tenants Asssociation. The association provides quality out of school care for children. 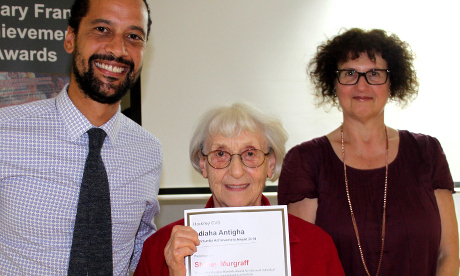 Finally, the Adiaha Antigha Mandela award for the most successful campaigner went to lifelong activist Shirley Murgraff. Accepting her award, Mrs Murgraff said that “being angry keeps her going”, especially during her battle to stop the privatisation of the NHS, which she described as the “jewel in the crown”.